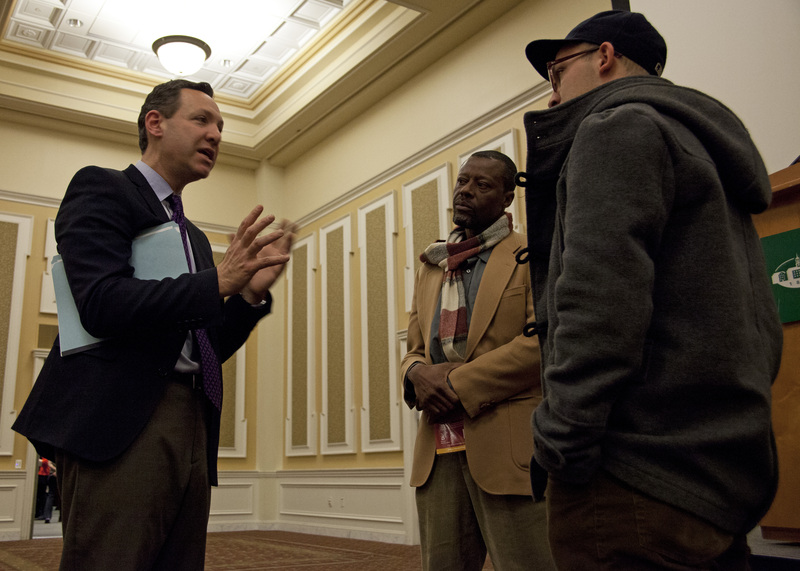 Jonathan Ray, a professor of Jewish Studies in the Theology Department of Georgetown University, gave a speech on the importance of Jewish history, Thursday in Baker Ball Room. Photo by Lauren Prescott. 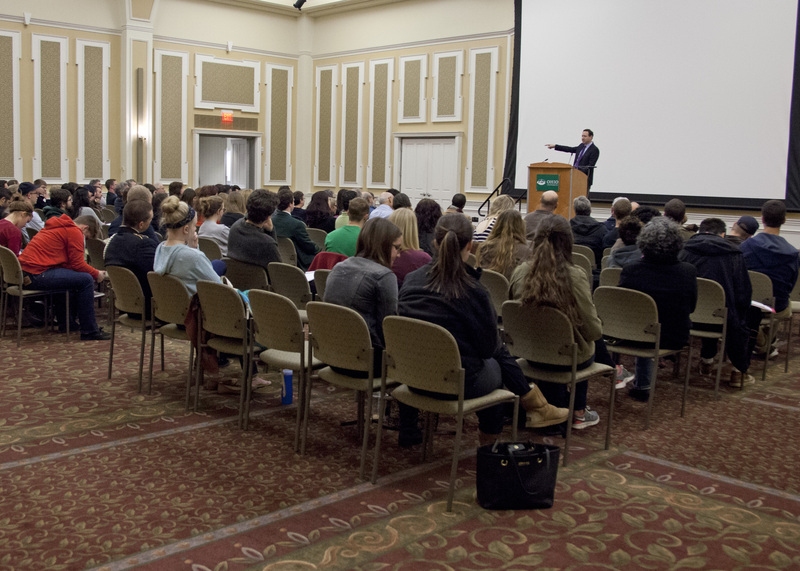 On Thursday evening, Ohio University’s Department of History hosted their 17th Annual Lazaroff Lecture in the Baker Ballroom. 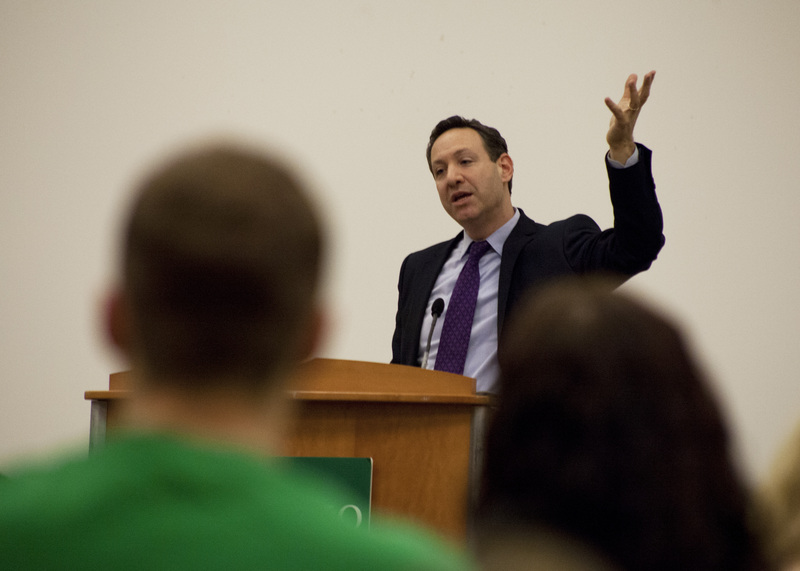 This year’s lecture featured Jonathan Ray, who is an associate professor of Jewish studies at Georgetown University. The lecture posed the question of who was a Jew in the Middle Ages, which Ray covered by focusing primarily on the conversions of Jews in the Spanish Empire. Ray opened with a discussion about the boundaries of Judaism and what defines them. Whether it involves biological elements, theological ideas or the practice of Jewish culture, what defines an individual as Jewish is a question that has been asked and debated for ages. Ray animatedly speaks at Tuesday evening’s Lazaroff Lecture. Photo by Lauren Prescott. Ray alluded to famous Jewish comedians such as Jerry Seinfeld and his schtick about converting to Judaism “for the jokes.” He also mentioned comedian Jon Stewart, who claims to not be religious, but still considers himself Jewish as a cultural affiliation. According to Ray, the historical question of what defines someone as Jewish can be unclear. “Who gets to decide if he or she is a Jew?” Ray said, presenting one of several questions to be addressed throughout the lecture. He explains it as a built-in problem for Judaism, which doesn’t have a central authority like the Pope, who followers can potentially turn to for leadership on these debates. Ray then turned the lecture’s attention to late Medieval Spain, when waves of conversions to Christianity occurred, by choice or otherwise. “How is what we call religion today defined by the Medieval Ages?” Ray asked. He continued by explaining that despite the fact that Jewish laws give a clear description of what Judaism is according to community, beliefs, practitioners and the obedience of God’s law, it wasn’t simply defined by these criteria during medieval Spain. Audience members speak with Ray after the lecture. Photo by Lauren Prescott. During the Middle Ages, Judaism became the minority religion out of the world’s three major religions, with Christianity and Islam holding the majority. Most of the Jewish communities were subjugated by either Christian or Muslim governments. While it was neither required nor expected, people of the minority religion were allowed to convert to the dominating religion of their area, but never the opposite, which was punishable by death. Some would choose to convert to the majority religion for whatever reason, oftentimes being that it would make their lives easier without extra taxes and less bereavement. During the 14th century, forced conversion rapidly spread in Spain’s Iberian peninsula. This time, Ray examined the Jewish community in the Spanish Empire, where more and more riots and violent outbursts were committed by Christian people against the Jewish population. The kings and authoritative positions who tried restricting such actions against the Jews were usurped by the masses of Christians determined to get Jews to convert. Ray explained that many Christians saw this increase of forced conversion as an apocalyptic sign that assigned them the duty of getting the Jewish population to convert. After the masses of conversion that took place, a new dilemma rose for Christians, and a new way to define someone by their religion, race or inherited culture came to play. Christians soon turned on los conversos, or the converts to Christianity, discriminating against them and determining them to be of a lesser or even false Christian status. 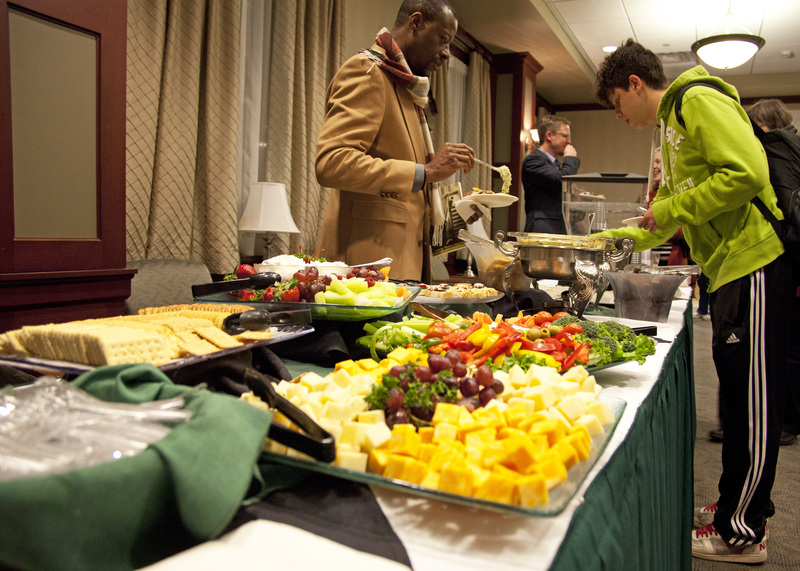 A reception was held after the speech, providing a chance for attendees to speak with Ray about the lecture. Photo by Lauren Prescott. If someone had any trace of Jewish blood, they were unequal to these “purebred” Christians. Thus, the question of what identified someone as Jewish became a significant debacle. While on one side, “purebred” Christians argue against practicing beside converts and allowing them into leadership positions; the same thing happened with other Jewish communities. When converts fled to Northern Africa and other places to seek refuge from the Spanish Inquisition, they joined Jewish communities again; however, people in these communities saw them as lesser Jews. Throughout this tumultuous and long-lasting tug-of-war of religious definition, Ray explained identity became bound by modern ideas. He addressed the audience with several questions throughout the night, some of which including how effective religious leaders are in terms of defining a follower and how capable individuals are of defining themselves. “Discussions and questions like these challenge us to consider our own notions of identity,” Ray said, leaving the audience pondering these historical debates considering new perspectives about our own and our society’s definitions of religion and culture. ← 2014 movie adaptations: The good, the bad and the ugh, really?